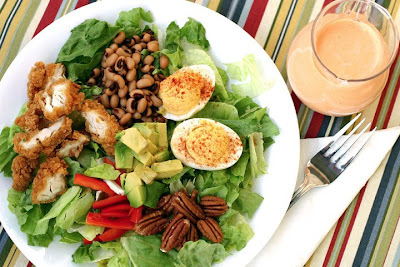 I noticed a version of this salad in June’s BHG magazine. I love cob salad and variations on the theme are a happy sight. I’ve streamlined the recipe for weeknight preparation. I don’t like to spend a ton of time on salad prep, and prefer to quickly get to the eating part. In a small food processor puree the ingredients together for a minute until it starts to thicken. Pour into a serving container and set aside. 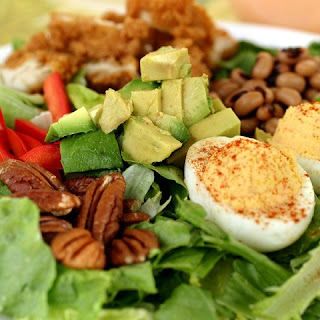 The dressing can be made ahead and refrigerated until ready to use. 1. Cut the hard boiled eggs in half. Scoop out the yolks into a bowl, mash with a fork, and stir in just enough pimiento cheese dressing in to make creamy. Add salt, pepper, and paprika to taste. With a cookie scoop, scoop the mixture back into the eggs. Go sparingly so you don’t run out of yolk mix. Sprinkle with paprika and set aside. 2. Place the pecans on a plate and microwave in 30 second increments until toasted. About 1 to 1 ½ minutes. 3. Cut the chicken into slices. Warm in the microwave on medium heat for a short time if needed. Set aside. 4. Arrange the lettuce on the plates. Top with a little of each topping in small piles around the plate. Sprinkle with a small amount of salt and fresh cracked pepper to taste. Drizzle with the pimiento cheese dressing. Recipe by Laura Flowers with inspiration from BHG magazine. This looks like one terrific salad. A whole meal! Delicious! The dressing sounds amazing!! I definitely have to try it. What do MorningStar Farms Chik'n Patties taste like? I always look at them but have yet to purchase any. My seventeen year old son is a “new” vegetarian and I am on a quest for new products and recipes for him. What a great looking salad. The salad dressing has caught my fancy and I'm going to reduce the recipe (just two of us) and give it a try for our dinner salad tonight. This looks delicious! I love a good salad! I will have to try the dressing, it sounds yummy! Thank you! Ginger, those Chik'n patties are pretty darn good. I love that the photo looks like a deconstructed salad--but unified! Very pleasing to the eye. Tillamook Vintage White is one of my favorite cheeses, and now I'm going to have to try that dressing just so I can get my fix. Oooh, this looks so good. I don't know how I managed to miss this post, but I'm glad I found it. Great photo! WOW! Love the sound of this dressing! Thanks for the recipe!